Earlier version of Bird 4391A, specifications are unchanged. Used in Good Condition, most have cosmetic flaws but are functionally AOK. 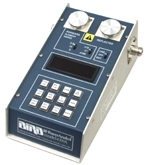 The Model 4391A is a Rugged RF Power Analyst that monitors Peak Pulse Power, Peak Envelope Power, or CW Power during normal equipment operations in the forward or reflected direction. Designed for air navigational aids DME, ATC and other pulsed RF systems such as telemetry, radar, command and control, etc. Internal 115/220 VAC supply. Batteries are not included in the warranty on used equipment.